Hey everyone! I’m a bit late to the game, as I have yet to post about my externship experience, but this semester has just been so busy! Nonetheless, I wanted to talk to you guys about my decision to stay local for my externship, since the rest of the Ambassadors went abroad! I split my experience into 2 different opportunities, so read on for the specifics of each one! Dr. Katie Jordan is one of the coolest and most inspiring people I’ve had the pleasure of meeting during my time at USC. She embodies the type of leader that I aspire to be one day, therefore I couldn’t pass up the opportunity to see how she manages to do it all. Before I go any further, I’m going to list out all of her roles (and I’ll probably miss some): she is a professor in our program, the Associate Chair of Clinical Occupational Therapy in the division, the Director of OT and Speech Therapy at Keck and Norris Hospitals, she works at AOTA on the Relative Value Scale Update Committee, and is the Co-Chair for OTAC’s Practice, Ethics, and Reimbursement Committee. She is also a mentor to residents going through the OTD program, as well as students like me that have an interest in advocacy. On top of all of that, she is an amazing mother and wife. My interest in meeting with her started back when I was a first year in the program. Whenever I would meet with my mentor, Dr. Jordan’s name would inevitably come up as someone that I should get in touch with. For one reason or another, it never happened, therefore our leadership externship seemed like the perfect opportunity to do reach out and shadow her! I’m so glad that I did, because I learned so much during the short week I spent with her. I went to most of her meetings, got to listen to conference calls, and got to see what each of her roles really entail. It was amazing to see her transition in and out of each of her roles so flawlessly. No matter how crazy her schedule got, she always remained composed, which is something I admired. She speaks with authority but isn’t rude, and represents our profession really well. She is incredibly knowledgeable on all things OT — even on things we all wish weren’t a part of our jobs like dealing with billing and Medicare — and has a great ability of explaining things in a way that’s easy to understand. 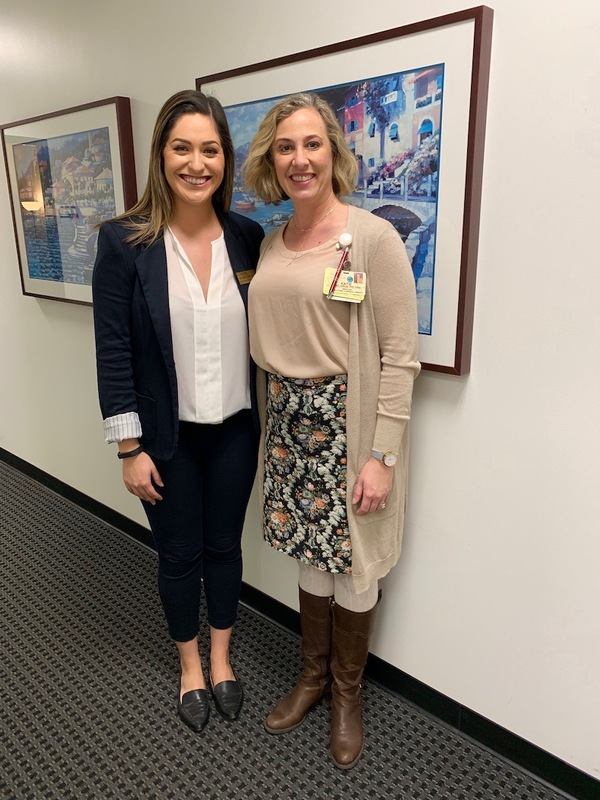 Shadowing Dr. Jordan taught me about where we can go as OTs as far as leadership goes, but I also learned a lot about the intricacies of her roles, and what it’s like working with large groups of medical professionals that may have differing thoughts on various issues. I met Terri Nishimura when she was part of a Leadership Panel for our Capstone course this Spring. During the panel, she was very vocal about our responsibility to advocate for our profession, and how becoming politically involved is also really important. As someone who has stayed away from politics for the last couple of years, this was hard for me to accept. However, she made a compelling argument. As the CEO of a non-profit organization, the services she’s able to provide and the funding for those services are all impacted by legislation. Although our state and national organizations do a great job of trying to keep up with all of the political changes that are occurring and advocating for our profession, it is still important for us to be involved as well. She gave the example of how decades ago, she started a friendship with one of the councilmembers in Torrance (which is where PTN is located). Over the years, he kept advancing in the political world, until he became one of our state senators. There was a bill that was threatening the services OTs could bill for in pediatrics, so she reached out to him and asked that he not only not vote for that bill, but that he help to educate the other senators on the reasons why passing this bill would have negative implications for OT. He happily did so because of their established relationship, and fortunately that bill didn’t pass. She stressed that advocacy isn’t a one-and-done situation, but that we have to put in the time to develop strategic relationships. This story was really impactful for me, because I hadn’t given much thought to what we could do, therefore I was eager to learn more. I approached her after class to ask if she’d be willing to host me for the second half of my externship, and she happily accepted! During my time with Terri, I got to learn a lot about what it’s like to be a CEO, as well as a leader in the pediatric community. I got to help Terri plan for a legislative reception for OTAC, where I got to meet with many OTs that hold leadership positions within OTAC! I learned who my local, state, and federal representatives are, and how to find that information if I ever need it. Before this experience, I felt like the world of politics was just something I did not want to get involved in. Even if I did, i felt like I wouldn’t know where to start. Thanks to Terri’s guidance, I now have a much better understanding of what we can do and how to do it. Ultimately, there are pros and cons to going abroad and staying local for our externships. Going abroad can be expensive, but we get the opportunity to see what occupational therapy and healthcare look like in different countries! Staying in LA is not nearly as enticing as going abroad, but the connections you make are hopefully some that will last for a lifetime, and can help you when you’re venturing out into the real world as a new grad! In the end, the choice is up to you, but just keep in mind that there are plenty of wonderful opportunities no matter where you go.